Dr. Terry Wahls learned how to reverse accelerating multiple sclerosis using an evidence-based, functional medical approach focusing on orthomolecular nutrients and nutrition. Using the lessons she learned at the subcellular level, she used diet to cure her MS and get out of her wheelchair. Her TED talk is quite convincing. Contemporary medicine has not understood the basics of mitochondrial physiology. Most doctors have no idea why magnesium, bicarbonate, selenium and sulfur are important to the mitochondria. But basic science knows this so it is a wonder that information does not get out about what to do to repair and fire up the mitochondrial energy factories of the cells. only be to prevent too many mitochondria from failing. 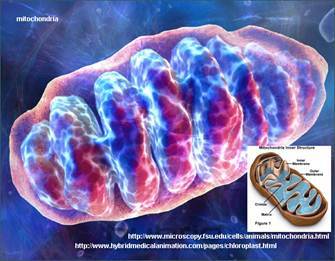 The mitochondria are the power stations of our cells. They are as important to our lives and healths as electrical power stations are to modern civilization. We just cannot get along without them. If mitochondria get severely damaged, they die. If cells lose their mitochondria, they lose their power source, and they die. When enough cells die, we die. Mitochondria disease is not usually life threatening in an emergency sense. There are few infections that attack the mitochondria though there are poisons like cyanide which will wipe out our energy stations and kill us without much fanfare. The mitochondria are extremely sensitive to heavy metals and general chemical insults. If the mitochondria are denied the basic nutrition they need to function, they cease to function normally. Dr. Majid Ali says, “Injured mitochondria mutate at much higher rates. Damaged mitochondria are exhausted mitochondria. 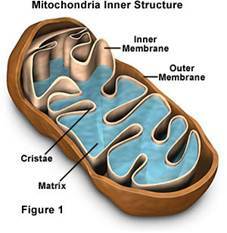 Exhausted mitochondria cannot produce sufficient ATP molecules. An insufficient supply of ATP molecules means insufficient energy. Insufficient molecular energy means clinical chronic fatigue.” These organelles are the power generators of the cell, converting oxygen and nutrients into ATP (adenosine triphosphate). ATP is the chemical energy "currency" of the cell that powers the cell’s metabolic activities. This process is called aerobic respiration and is the reason animals breathe oxygen. potential and a pH gradient across that inner membrane. The mitochondrion is different from other organelles because it has its own DNA and reproduces independently of the cell in which it is found; an apparent case of endosymbiosis. They really are not quite us in the sense that their genetic pool is outside of our own DNA that make us uniquely us. Unlike nuclear DNA, mitochondrial DNA doesn’t get shuffled every generation, so it is presumed to change at a slower rate. Recent breakthroughs in our understanding of autism and other neurological diseases are coming through mitochondrial research and it is important to note that pharmaceutical drugs are mostly mitochondrial poisons. Mercury is a mitochondrial poison. Data suggest that moderate levels of mercury administered over an 8 week period can affect adversely the integrity of mitochondrial membranes. The field of pediatrics has been perverted by the vaccines and endless antibiotics they have administered to their patients. Pediatricians do the unforgiveable when they inject mercury directly into children’s veins and that is why I wrote and have always given away The Terror of Pediatric Medicine. “The German cancer researcher Dr. Paul Gerhard Seeger demonstrated in 1938 that in most cases cancer starts in the cytoplasm, the jelly-like outer part of the cell, and especially in the energy-producing mitochondria. Here food fragments are normally oxidized in a series of enzymatic steps called the ‘respiratory chain’. Seeger showed that in cancer cells this respiratory chain was more or less blocked, especially at the site of the important enzyme cytochrome oxidase. Without it the cell can produce energy only anaerobically like a fungal cell. This is very inefficient and the resulting overproduction of lactic acid makes the cell and the whole body overly acidic. Seeger and others found that cancer cells utilize only between 5 and 50% of the oxygen of normal cells. The virulence of cancer cells is directly proportional to their loss of oxygen utilization, and with this to the degree of blockage of the respiratory chain. In 1957 Seeger successfully transformed normal cells into cancer cells within a few days by introducing chemicals that blocked the respiratory chain. Seeger’s most important discovery was the certainty that that certain nutrients, mainly from the vegetable kingdom, could restore cellular respiration in low-virulence cancer cells and, with this, transform them back into normal cells. Seeger’s finding that cancer originates in the cytoplasm and not in the nucleus was confirmed by other researchers. Between 1975 and 1977 they repeated an experiment 93 times in which they replaced the nucleus of a fertilized mouse egg with the nucleus of a cancer cell. In each case the egg developed into a healthy, cancer-free mouse and even the offspring remained cancer-free. Similar results were achieved with frog eggs. There is increasing evidence that impairment of mitochondrial function, oxidative damage, and inflammation are contributing factors in the pathogenesis of Parkinson’s disease (PD). There is substantial evidence that there is a deficiency of activity of the mitochondrial electron transport chain in PD. Impaired mitochondrial function and activated microglia may both contribute to oxidative damage in PD. Multiple Sclerosis is the most common inflammatory demyelinating disease of the central nervous system and is the leading cause of non-traumatic neurological disability in young adults. Researchers believe that mitochondria play a key role in chronic axonal loss in this disease. The mitochondria present within the chronically demyelinated axons will be functioning at full capacity for many years but eventually, despite antioxidant defenses, free radical damage will accumulate and mitochondrial function will become compromised. ATP concentration within the axon will decrease and the effect on axonal function will be profound. Tissue damage in 2,4,6-trinitrobenzene sulfonic acid (TNBS)-induced colitis is accompanied by the arrest of mitochondrial respiration, loss of mitochondrial DNA, and the expression of nuclear-encoded mitochondrial proteins. Selenium effectively protects colon mitochondria prevented inflammatory and necrotic changes. Selenium in a high dose is therefore a potential therapeutic agent in inflammatory bowel disease. Nearly a century of scientific research has revealed that mitochondrial dysfunction is one of the most common and consistent phenotypes of cancer cells. A number of differences in the mitochondria of normal and cancer cells include differences in mitochondrial metabolic activity, molecular composition of mitochondria and mtDNA sequence, as well as in alteration of nuclear genes encoding mitochondrial proteins. Mitochondria and Cancer, edited by Keshav K. Singh and Leslie C. Costello, presents thorough analyses of mitochondrial dysfunction as one of the hallmarks of cancer. acid alkaline balance of the body cannot be maintained without it. Sulfur is a main source of antioxidants in the mitochondria. Sulfur has a vital relationship with protein, since sulfur is found in the amino acids methionine, cystine, and cysteine. Thus, these amino acids are known as the sulfur bearing amino acids which are considered the building blocks of protein. Magnesium functions as a bicarbonate co-transporter into cells. And bicarbonate acts as a transporter of magnesium into the mitochondria. Magnesium influx is linked with bicarbonate transport according to the Dietary Reference Intakes guide from the Institute of Medicine. Magnesium transport into or out of cells requires the presence of carrier-mediated transport systems. ATPase reaction has a broad pH optimum centering on neutral pH, with little significant activity above pH 9.0 or below pH 5.5. Thus anything that moves us from overall acid conditions toward alkaline that recover the neutral zone is going to enhance cell metabolism via mitochondrial optimization. If cancer is a mitochondrial disease it can be treated directly with a cocktail of magnesium bicarbonate, sulfur and selenium and it would probably be a good idea to supplement strongly with iodine as well. All of these basic cellular substances will work together to repair damaged cells and their mitochondria and fire them up for full activity. In the near future it will be magnesium bicarbonate available in concentrated form that is going to turn the world of oncology upside down. It may be a year before production can make this compound in concentrated form widely available to the public. Presently it is available to only a precious few but magnesium bicarbonate water is available in a few bottled waters like Noah’s in California and Unique Water in Australia. Within a few weeks I will be introducing a gravity fed Berkey-type of water filter, which will be the first in the world to produce magnesium bicarbonate water in peoples’ homes. ORGANELLES mean little organs. Basically this means that organelles have specific roles to play in how cells Gunther, 1003; Romani et al., 1993work just like organs help the body to function properly as a whole. Some organelles are separated from the rest of the cell by lipid bi-layers similar in structure to the cell membrane. The endosymbiotic theory concerns the origins of mitochondria and plastids (e.g. chloroplasts), which are organelles of eukaryotic cells. According to this theory, these organelles originated as separate prokaryotic organisms which were taken inside the cell as endosymbionts. Mitochondria developed from proteobacteria (in particular, Rickettsiales or close relatives) and chloroplasts from cyanobacteria. The effects of mercury ingestion on hepatic mitochondrial membranes of chicks. Poult Sci. 1976 Nov;55(6):2280-4.